Make 24 cookies shaping as directed on package. Meanwhile, in microwavable bowl, microwave caramels and water uncovered on High in 30-second intervals until mixture can be stirred smooth. Drizzle caramel over cooled cookies with spoon. Immediately sprinkle with sea salt. If caramel is not smooth enough, you can add another 1/2 teaspoon water at a time until desired consistency. You could bake and freeze the cookies ahead of time and then add the caramel and salt before serving. We say, salted caramel makes every dessert better. 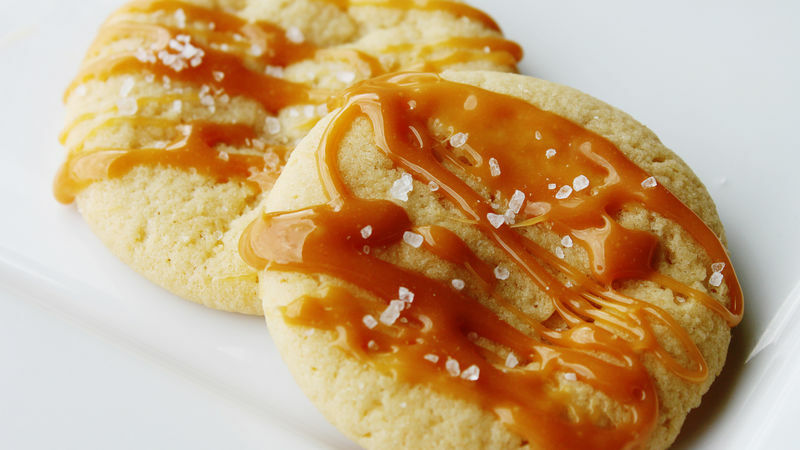 Case in point: these incredibly simple salted caramel cookies that are easy to make in a pinch. You only need four ingredients! The caramel sauce couldn’t be easier. Just grab a bag of caramels from the store, heat them unwrapped in the microwave, sprinkle with some sea salt and, boom! Almost-instant salted caramel sauce. Of course, you can make your own salted caramel sauce from scratch if you have the time and want to give it a try. You only need a few pantry staples to make it: 1 cup of light corn syrup, 1 ¼ cups of packed brown sugar, ¼ cup of butter, 1 cup of heavy whipping cream and some sea salt. Simply heat the corn syrup, butter and brown sugar in a saucepan on the stove to boiling and then stir on low heat constantly for five minutes. Stir in the whipping cream and heat until boiling. Then allow the sauce to cool for 30 minutes. Add some sea salt and sprinkle over your cookies! You can store this sauce in the refrigerator in a sealed container for up to two months. Want more ways to jazz up your cookies for the holidays? Read all about it in our How to Make Cookies article, or browse all of our best sugar cookie recipes.